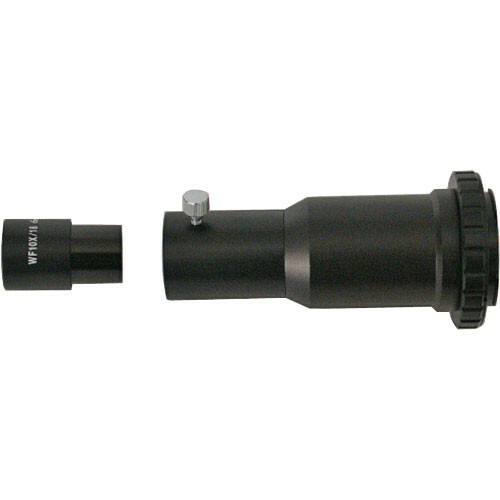 Designed for their #5424 Crystal Zoom microscope, the Konus #5126 SLR Photo Adapter enables you to connect your DSLR camera for photographing specimens. It comes with an 10x power wide field eyepiece, and a Pentax K-mount T-ring. Additional optional T-rings for other mounts and manufacturers are widely available separately. Box Dimensions (LxWxH) 7.25 x 3.2 x 3.1"
Does this adapter provide 10x magnification for an attached DSLR or just for direct eye viewing? I need 10x magnification for my camera, not my eye. It's a 10x Wide Field Eyepiece. It's for the eyepiece of the Microscope. If you attach your Camera Body the image will be Magnified 10X.